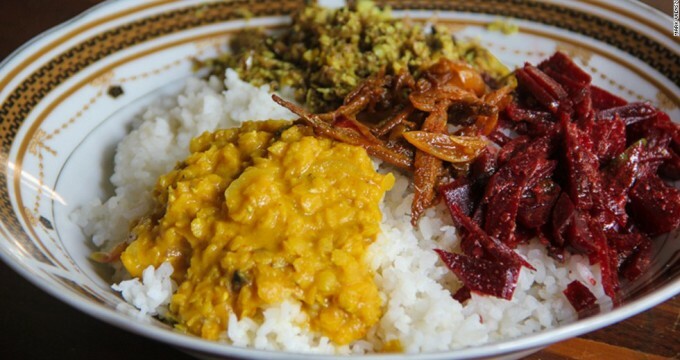 If one is to describe of cooking in Sri Lanka, one must begin from the times of our ancestors. Being mainly an agricultural society with the teachings of Buddhism and combined with the guidance of Ayurvedic practices, the art of cooking was unique to this country alone. True, there are impressions made by various other cultures but the inherent uniqueness was cultivated over the centuries through practice and conveyed from mother to daughter as times passed on. Our ancestral teachings are evident in rituals practiced today in the modern Sri Lanka. For example, the alms offering at the Sacred Temple of the Tooth Relic, protected by ancient kings as a sacred duty both to Buddhism and the country, is based on a royal decree of the last King of Sri Lanka – Sri Wickrama Raja Singha. The alms giving epitomizes the offerings of vegetarian food, practiced even today. It is told that these offerings are based on the Kings own menu created by royal chefs of ancient Sri Lanka. The King is known to have eaten 32 mouthfuls of rice combined with 32 curries. Not in a manner that is the current practice where all the curries are combined with the rice together and eaten using ones fingers, but for one mouthful of rice the King would only have a single curry. Perhaps the use of the word curry is misleading as there may have been a variety of dishes such as meats, poultry, vegetables etc created in salads, stewed dishes and many more varying methods of cooking, on the King’s menu. Most probably the 32 dishes would have been prepared using 32 different methods. To differentiate the dishes a selection of ingredients known locally as Kulu Badu were used. These were many, and most had therapeutic powers. Known for their ability to aid in the human bodies own healing and also to guard against the ailments prevailing at certain times. Due to the lack of records most of these ingredients are hidden from a majority of us. It is still possible that parts of trees and plants are used by people residing in remote areas for their cooking whilst it is hitherto unknown in the populated areas. Currently we have 42 such ingredients of which 38 are known to have medicinal properties. These are used by Sri Lankans even today. We have never used artificial flavorings, colorings or additives in our cooking at all. This is one of the reasons why Sri Lankan cookery is valued highly by visitors to this country. If we consider the qualities of ingredients, the therapeutic qualities were utilized to guard against ailments and introduced to a person through the meal itself. Even in the more recent past, it was unheard of for an eighty year old to have suffered from ailments or to have visited a doctor or a Veda Hamuduruwo. Our food used to make us strong and resilient. Even if medication was sought, food went hand in hand with the medicine prescribed for not all food is good for most Ayurvedic treatments and the wrong food combined with the correct medication would be life threatening indeed. Any visitor to this country will definitely be amazed at the variety of foods on offer, from enticingly hot dishes to the most mildest of curries and a whole lot more. Here we will include authentic Sri Lankan recipes for your reference.